employees - a 63 percent increase from the previous year. 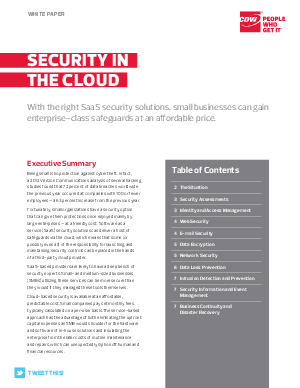 Cloud-based security is available at an affordable, predictable cost. Small companies pay set monthly fees, typically calculated on a per-user basis. The service-based approach has the advantage of both eliminating the upfront capital expenses an SMB would shoulder for the hardware and software of in-house solutions and insulating the enterprise from the later costs of routine maintenance and repairs, which can unexpectedly siphon off human and financial resources.